The ACR1252U from ACS is a 13.56 MHz USB conactless smartcard reader that supports ISO 14443 type A and B cards, MIFARE, FeliCa, and ISO 18092�compliant NFC cards and tags. Replacing the popular ACR122U, this reader provides compatibility with a wide range of cards, tags, credentials and up-to-date hardware. 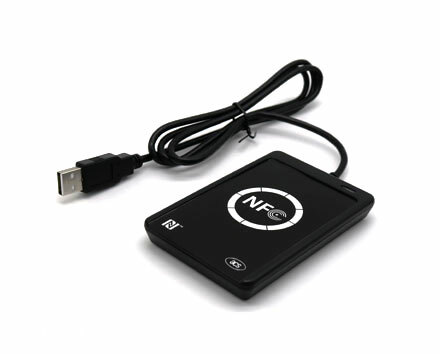 NFC Forum certified, the ACR1252 supports all three modes of NFC with improved performance, including card reader/writer, card emulation and peer-to-peer communication. The ACR1252 is CCID and PC/SC compliant, allowing interoperability with various different devices and software applications. The ACR1252U is compatible with Read-a-Card, the contactless card ID reading application, useful for the integration/enrollment of RFID technology into new or existing systems. An SDK is also available, as well as other model variations and OEM modules. Equivalent to ACS part ACR1252U-M1 but without the SAM slot. Development kit for the ACR1252 NFC contactless smartcard reader range. A compact 13.56 MHz NFC contactless reader with a SAM slot. NFC Forum certified. SDK also available.